I finished the Central Park Hoodie (sans hood) the night before we left for Virginia. In fact, I was still picking the basting thread out at the airport! 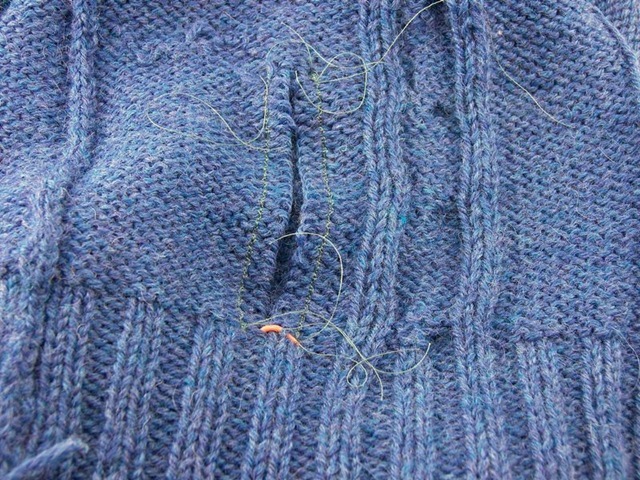 (Not intentionally, I just missed a few stitches and then some scraps stuck to the wool.) I wore it everywhere in VA and it was quite the conversation piece. 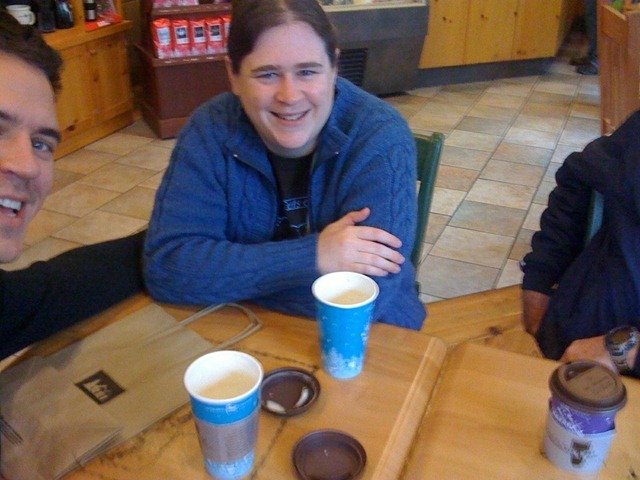 Needs more coffee. Also shown in this picture, 25% of my dad and 1/2 of Lowell’s face. A glance at the back, with a nice shot of my knitting bag too. Up ahead is my mom and her friend then it’s my grandmother and me. 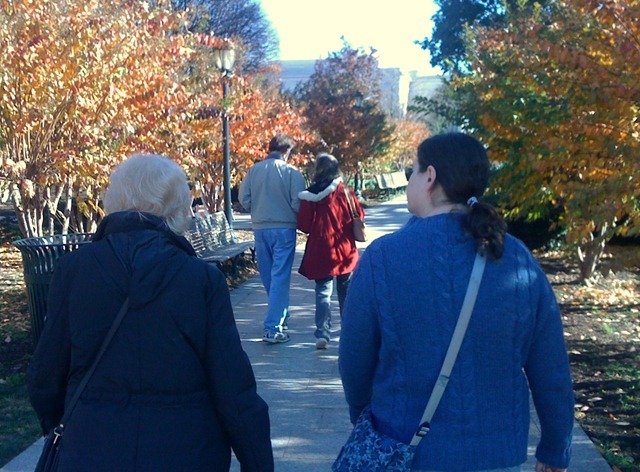 We’re walking through the sculpture garden in DC. 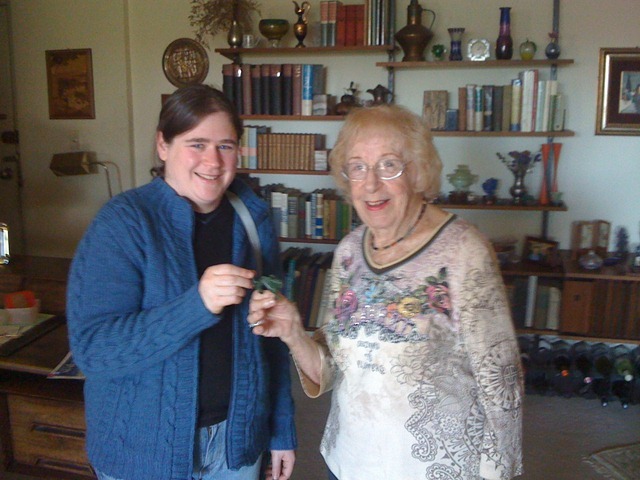 The documentation of the Exchange of the Jade Dragon. The Jade Dragon reveals the path to the secret treasure when held facing east on the last full moon of the year- oh wait, I’ve said too much. 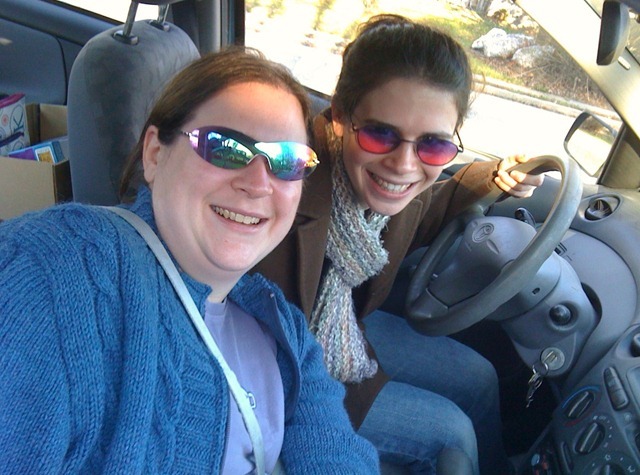 Look at our cool, cool glasses. You know you’re jealous. I’m very, very pleased with how the CPH turned out. I’ll write more about the mods I made and how they turned out when I have a chance to take some pictures with something other than my cell phone. I think I have pictures of the zipper-sewing which really wasn’t as bad as I thought it would be. For now, though, I’m going to don my CPH and help Lowell put up the Christmas lights. We’re horribly behind the rest of the neighborhood. I have officially finished all the knitting on the Central Park Hoodie! I dunked the whole thing in the bathtub yesterday with some Kookaburra and pinned it out to dry. I even managed to coax another inch or so of width out of the body. I did decide to redo the pockets. 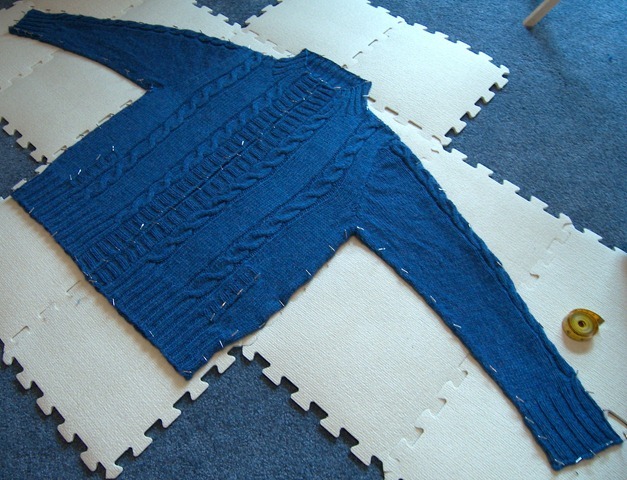 I tore out all the lining and lengthened the steek. This time I was much more careful as I sewed down the front; I think I managed to leave some flexibility in there. All that’s left to do now is to sew in the zipper when it’s dry! 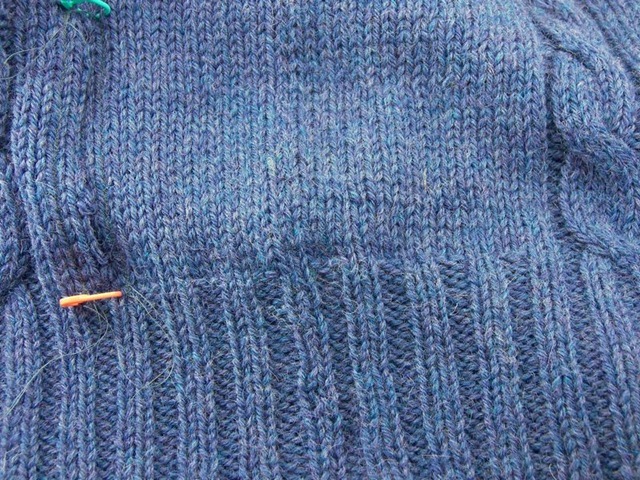 The sleeves on the CPH are taking forever. Other projects have been dumped. 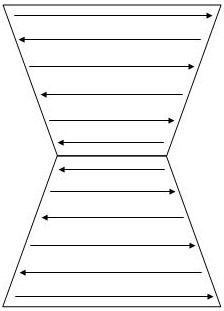 Much coffee has been drunk. 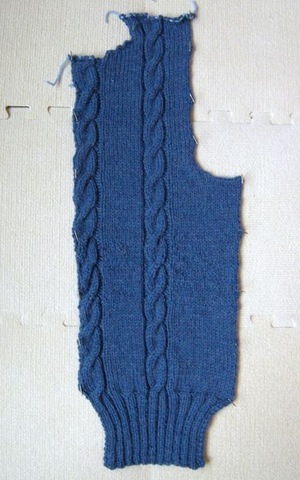 Despite decreasing every 5th round, the sleeve is not getting any faster to knit. I may not have found Yarnia, but I have definitely found a black hole. Wow. I love steeks. They’re awesome. This weekend was pretty busy. 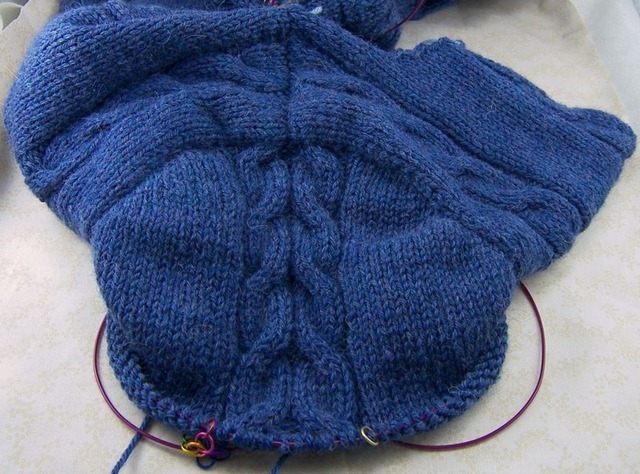 Mainly with knitting the Central Park Hoodie. I finished the fronts and seamed the jacket up. 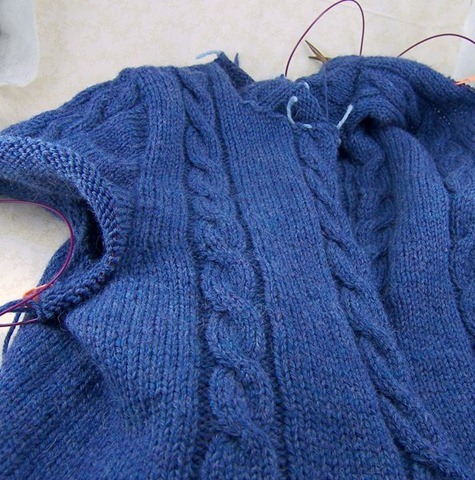 I was shocked to find that I do not hate seaming, like I thought. With a nice edge that hasn’t been ruined by slipping stitches and has been carefully blocked, seaming was actually kind of fun. Almost meditative. 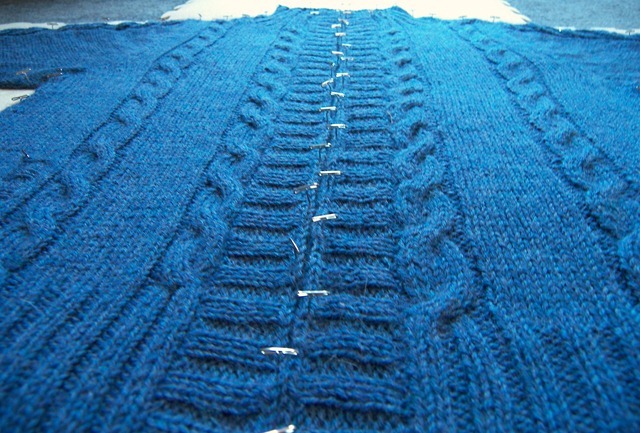 I also took a few swatches and practiced steeking. I highly recommend slicing up some swatches- it really removes the fear. 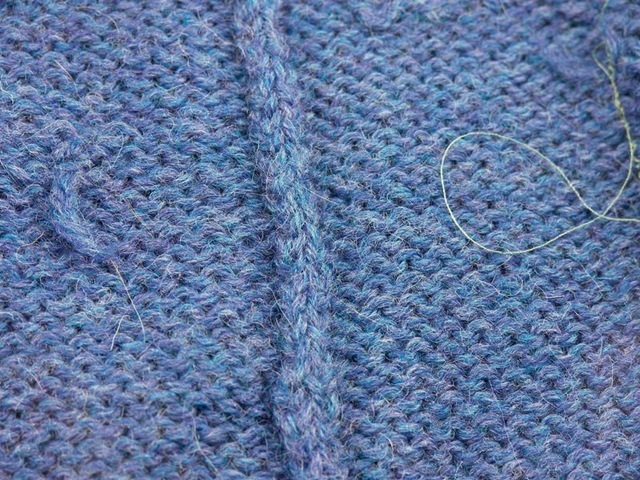 I tugged and yanked and jerked on the swatch and the stitches didn’t go anywhere they weren’t supposed to. Late Saturday night (because careful cutting of a week’s worth of work should always be done late at night) I cut pockets in the front of my CPH. The safety pins are holding on to the other stitches in the column that I cut. I’ll be picking up stitches along the edges to form the pocket and then I’ll sew the lining to those loose stitches to secure them. This was shockingly easy and kind of enjoyable. There was hardly any freaking out as I cut the knitting. Although I was very disappointed that the people with me were unimpressed by this sudden appearance of pockets. I might steek everything now. They’re really cool. My shoulder plan is working out well too. 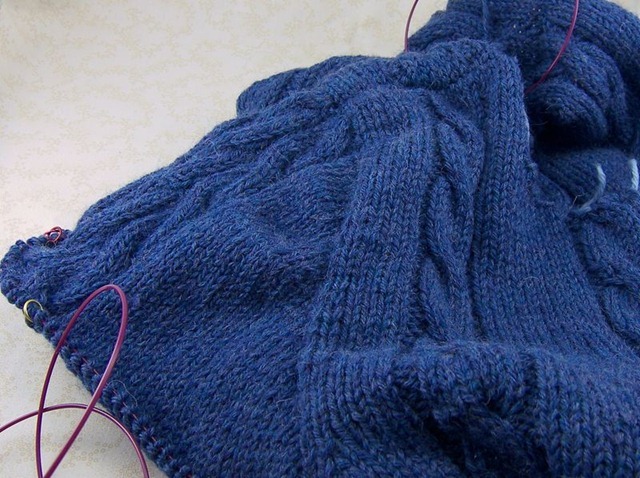 I knit the armhole about an inch longer than the pattern said (on purpose!) 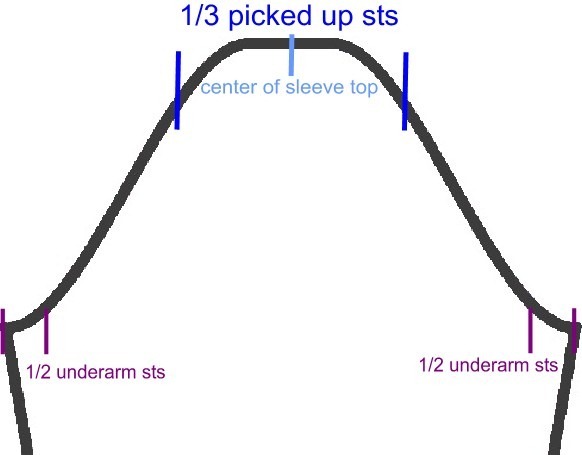 and instead of having to figure out what to do with the sleeve cap, I decided to work the sleeves top-down. 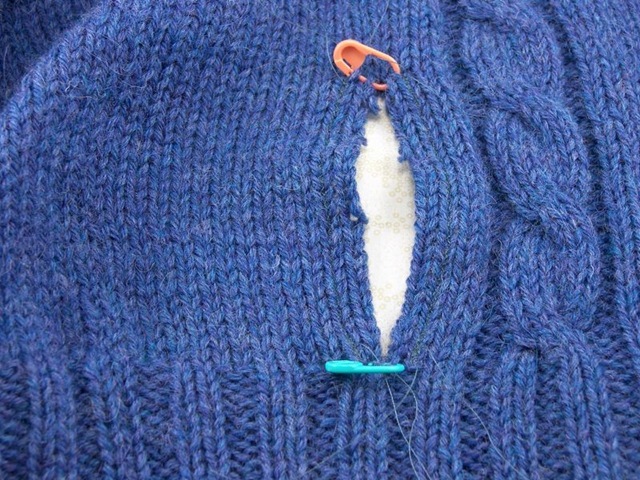 I seamed everything then picked up stitches around the armhole and worked short rows for the cap. I’ll write more about this process later. 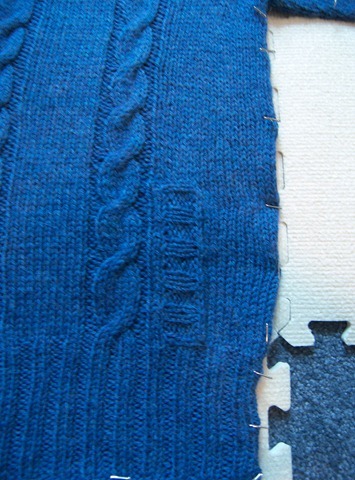 I can’t believe all sleeves aren’t done this way… it looks great! 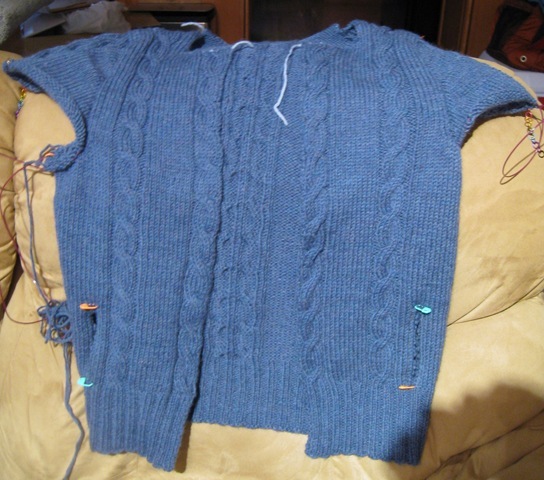 Left front went off without a major hitch and pretty fast, given that pretty much all I’m doing is knitting on this. Er, except that I forgot to put in the pocket. I really wanted pockets. 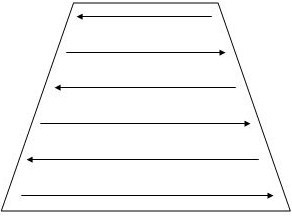 So, this is what I’m thinking: steeks. It’s ok, you can resume breathing now. 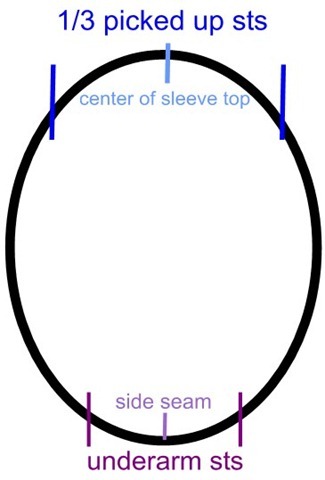 I haven’t done anything yet and I might decide that this is an outer layer that doesn’t need pockets. Ha, who am I kidding? I will pass up something I truly love if it doesn’t have pockets on it. I’m going to practice on those seven swatches that I made. My CPH is made with 100% wool, so it has some good “stickiness” to it unlike superwash. It shouldn’t be too hard… right? I mean, knitters have been steeking for hundreds of years. I figure I’ll decide where I want the pockets once I do up the shoulders and side seams, sew down the right columns, snip, cry, pick up stitches, and bam! Pockets. I can hear you laughing at me, don’t think I can’t!